Hidden Treasures from RTB: MEDIA on Vimeo. He lays out the different topics he wishes to cover in the book and challenges the reader to see the book of Job as speaking on more than just man's dealings with suffering, but that those dealings with suffering highlight the awesomeness of God's creation, God's power, God's love, God's justice, God's mercy, and God's sovereignty. Chapter 2 sets the historical context for the book of Job. Dr. Ross identifies the location of the happenings, the people involved, and the culture of the time. He establishes that he believes the discussion/debate among Job and his friends to be an historical event. He shows the dating of the writing to be prior to the accounts in the Pentateuch, and states that the content in Job was likely on Moses' mind as he wrote both Genesis and Deuteronomy. Dr. Ross contends that Genesis should be interpreted in light of the fact that the book of Job provides fillers for holes in the Genesis narrative and the discussion in Deuteronomy of God's plan to redeem humanity. Chapter 3 is a transition chapter. Dr. Ross covers many questions that have plagued mankind for millennia. He looks at the paradox of God being transcendent yet immanent. He explains how Job answers the questions of why both good and bad people experience good and bad events; why some of God's actions seem "evil" to us; why man complains about short or long life spans (and the reasons for both), which all lead to a discussion of death and its purpose. Each of the answers provided cover philosophical and theological grounds. He covers natural grounds by showing that God created the universe in certain ways to accomplish His purposes related to each of those ultimate questions. In Chapter 4, Dr. Ross begins looking at questions that the book of Job seemed to anticipate of later generations. He investigates some of the latest questions that have only recently arisen by the latest in scientific research: global warming, "bad" designs in nature, the Big Bang, and finding a "theory of everything". 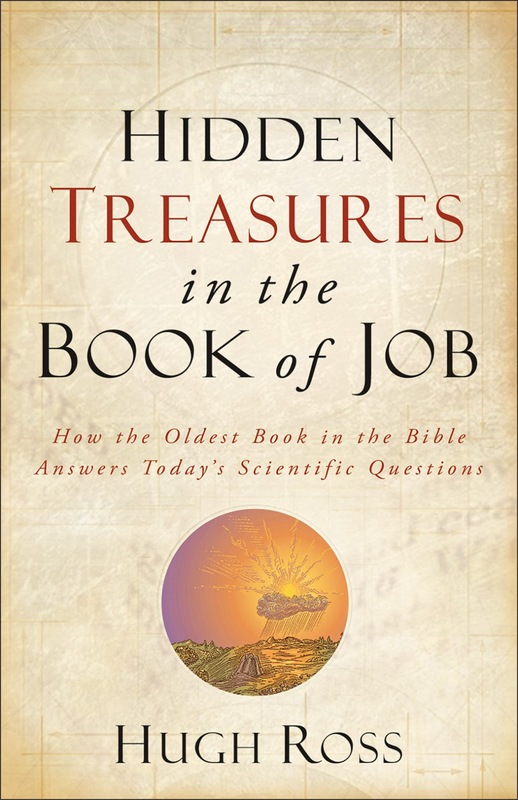 At the end of the chapter, Dr. Ross emphasizes the importance of predictability of scientific models for testing (he covers this in depth in his book "More Than a Theory"), and how the book of Job provides answers to questions that were not even being asked at the time the debate between Job and his friends was being recorded. Dr. Ross does not consider these answers to future generations' questions to be a coincidence. He claims each of these answers to be a powerful indicator of the divine inspiration of the book of Job. Chapter 5 focuses on the debate about the age of the universe and the proper interpretation of Genesis 1-2. Dr. Ross shows how looking at the creation passages in the book of Job can settle the controversies. He looks at several of the reasons that people ridicule the Genesis account of creation, then he explains how appealing to the book of Job allows for the proper interpretation of Genesis that just happens to be in line with the latest scientific findings. He also answers a few of the questions raised against the old-universe perspective by the young-universe crowd. Dr. Ross explains that it is important that all creation passages be taken into account when interpreting what claims the Bible makes regarding creation and how God accomplished it. In Chapter 6 Dr. Ross picks up in Genesis where he left off in Chapter 5. In this chapter he looks at controversies regarding God's day of rest from creation, the extent of Noah's Flood, rain prior to Noah's Flood, the eternality of the universe into the future, and animal death before the Fall of Adam. He shows how the book of Job can be used to help determine the correct interpretation of other passages of Scripture that allow for multiple interpretations. The positions that he defends via Job are that God's day of rest was not analogous to physical rest; that the extent of Noah's Flood was universal to all humanity but not global in physical extent; that rain did take place prior to Noah's Flood; that the universe is not future-eternal; and that animal death before the Fall of Adam did take place. He demonstrates how these positions not only take into account all of Scripture that speaks about the issues, but that none of his positions undermine any essential doctrine of orthodox Christianity. In Chapter 7 Dr. Ross moves from the more controversial topics to discussing what the book of Job can tell us about what it means to be human (vs. just an animal). He focuses on the fact that Scripture states that man is made in the Image of God, which make them distinct from the other living creatures. Dr. Ross looks at studies that demonstrate that some social behaviors, the awareness of God, the compulsion to worship something, and the concern with ultimate judgment separates human beings from animals. He shows how these discoveries confirm what Scripture states. He also places special emphasis on the distinctions that are described in Job. In Chapter 8 Dr. Ross looks at the differences between just the "soulish" animals and humans, although he does begin the chapter with a quick look at the issue with the origin of physical life. In this chapter, Dr. Ross discusses several studies that indicate a great difference between soulish animals and humanity. He looks at the intelligence of many of the soulish animals and shows how predictions based on common decent fail by these tests. He covers studies that attempt to figure out if soulish animals can actually plan for the future (not being based on past experience) and if they are capable of symbolic thought. Dr. Ross shows that the differences discovered between the soulish animals and man are not expected from a naturalistic worldview, but make perfect sense in light of the content of the book of Job and the rest of Scripture. In Chapter 9 Dr. Ross moves to investigating the soulish animals specifically. He contends that these animals were endowed with abilities and physical attributes that are specifically designed for the launch of human civilization, the enjoyment of humanity, help with past problems we have faced, and assist with future issues the human race will discover. He looks at the soulish animals in general and their seeming desires to please their caretakers. He has a section on Snowball the dancing cockatoo, that he shows is powerful evidence for soulish animals being designed with the future in mind. Then he shifts to discussing the three different kinds of soulish animals and their specific contributions to the human race through history and into the future. He ends the chapter by proposing that Adam's time spent with the animals (naming them) had not only the purpose of realizing that none of them were suitable for him as a mate, but that they would still be useful and enjoyable to him and his offspring in their life on earth. In Chapter 10 Dr. Ross looks at specific species of animals that were designed to "serve and please" humanity. He goes down the list in Job 38 and 39. He shows how each have been designed for serving humanity, developing relationships with humanity, or for other ways of pleasing humanity. Dr. Ross offers a powerful challenge to any naturalistic explanation for the creation of life on earth: since all these animals came prior to humanity, he asks how these animals seem so perfectly created for humanity if they were put on this earth without any "end goal" or idea of the future species in mind. He contends that the likelihood of any animals being suited perfectly for so many different aspects of a species that had not yet arrived on the scene, is so small that it had to have come from a Designer who, knowing what He would later create, created these animals with the later-to-come humanity in mind. In Chapter 11 Dr. Ross switches back to looking at the animals in general. He shows how the book of Job tells us to examine the animals for lessons about how we are to interact with each other (and the animals), how we need to be more humble in character, how we are to interaction with God, and what character man has presently (pride). He uses this as a spring board into the next chapter. In Chapter 12 Dr. Ross tackles the idea that Job speaks of dinosaurs existing with humanity. This is commonly used as evidence that Scripture supports only a young universe interpretation. Dr. Ross begins by showing that the context of the passages that mention the "leviathan" and "behemoth" are talking about the nephesh (or "soulish") creatures. Dr. Ross explains that the choice of the "leviathan" and the "behemoth", specifically, was to show just how difficult it is for human pride to be tamed. He then looks at the claims for each animal in detail. He goes back to the original Hebrew to see what are the ranges of interpretations of the words. He provides a compelling case for the idea that "leviathan" refers to a crocodile or alligator, and the "behemoth" refers to the hippopotamus. He address the claim that neither the crocodile nor alligator have been traditionally considered "soulish". He ends the chapter by explaining a few facts about dinosaurs that help show how they fit into his creation model. After spending the majority of the book demonstrating all that the book of Job tells us about creation and its Creator, In Chapter 13 Dr. Ross addresses the problem of suffering. He begins by providing the objection to the existence of an all-knowing, all-loving, and all-power God. Dr. Ross shows how Job recognized the reality of pain and suffering, but acknowledged God's sovereignty regarding it. He points out that Job believed that there would be a day that he would see God and that God was preparing him for that day through Job's sufferings. Dr. Ross explains that God's purposes for creating the universe the way that He did is to prepare the character of every person who will spend eternity with Him. With all the evidence that Dr. Ross has shown for the reliability and divine inspiration of the book of Job, one would ask, "so what?" In Chapter 14, Dr. Ross shows how God revealed His plan of salvation through Job. Dr. Ross addresses the claim of Job's friends that his suffering was due to some sin in his life. Job rejected that idea (discussed in Chapter 13). Job explained to his friends God's plan for providing salvation. Dr. Ross shows how every aspect of God's plan was laid out, not only by Job, but by Elihu in the book of Job. Dr. Ross concludes that the book of Job is evidence that God's plan for salvation can be seen through God's creation. In the final chapter Dr. Ross explains to his readers that we must emulate Job. In our search for answers we must never give up on God or malign His character, and we must be patient. Having all the answers at our fingertips would likely cause us boredom and a lack of concern with theological matters. God has hidden just enough about His character for us to truly appreciate and value it when we discover it. Dr. Ross urges people to continue to search for truth about God in the revelations He has given us. For the one who is truly seeking the truth, he will find it. Hidden Treasure In The Book of Job was quite the enjoyable and exciting book to read. It provides many challenges to the reader: both Believer and unbeliever. He provides much powerful, scriptural evidence for his specific position on how God created the universe, and much evidence from nature to demonstrate the symmetry between Scripture and what man has discovered in nature. Dr. Ross offers compelling reasons to take the book of Job and its content seriously in one's life. He shows how Job spoke to questions that people have asked for millennia and ones that people have only recently began to ask. He shows how Job recognized his own fallenness and need for a Savior. He offers how Job can be a great example for those who suffer, are searching for truth, or both. This book is highly recommended for everyone to read. It is written on a lay level, yet the concepts will challenge even the most educated mind. For both supporters and skeptics (regardless of which kind) of his creation model, it provides much scientific and scriptural evidence for his position. This book is a great addition to any scientific, theological, or philosophical collection. Also, check out this review of the book by Arthur Khachatryan at Cold and Lonely Truth. Thanks to Brian Auten at Apologtics 315 for publishing this review on his site. This review is only one of many in a project by Auten to build a solid collection of reviews of books of interest to Christian apologists. His collection grows on a weekly basis; check it out here.